A blood test is a laboratory analysis performed on a blood sample that is usually extracted from a vein in the arm using a hypodermic needle, or via fingerprick. Multiple tests for specific blood components, such as a glucose test or a cholesterol test, are often grouped together into one test panel called a blood panel or blood work. Blood tests are often used in health care to determine physiological and biochemical states, such as disease, mineral content, pharmaceutical drug effectiveness, and organ function. Typical clinical blood panels include a basic metabolic panel or a complete blood count. Blood tests are also used in drug tests to detect drug abuse. In some of the United States, a blood test is required before marriage. A venipuncture is useful as it is a minimally invasive way to obtain cells and extracellular fluid (plasma) from the body for analysis. Blood flows throughout the body, acting as a medium which provides oxygen and nutrients to tissues and carries waste products back to the excretory systems for disposal. Consequently, the state of the bloodstream affects, or is affected by, many medical conditions. For these reasons, blood tests are the most commonly performed medical tests. If only a few drops of blood are needed, a fingerstick is performed instead of a venipuncture. Phlebotomists, laboratory practitioners and nurses are those in charge of extracting blood from a patient. However, in special circumstances, and emergency situations, paramedics and physicians extract the blood. Also, respiratory therapists are trained to extract arterial blood to examine arterial blood gases. A basic metabolic panel measures sodium, potassium, chloride, bicarbonate, blood urea nitrogen (BUN), magnesium, creatinine, glucose, and sometimes calcium. Tests that focus on cholesterol levels can determine LDL and HDL cholesterol levels, as well as triglyceride levels. TSH Thyroid-stimulating hormone Thyroid regulates the function of metabolism. Low levels can lead to weight loss, while high levels lead to weight gain. 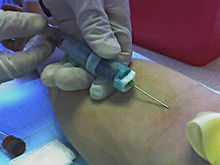 ^ "Venipuncture - the extraction of blood using a needle and syringe". Retrieved June 21, 2012. ^ MacLennan CA, van Oosterhout JJ, White SA, Drayson MT, Zijlstra EE, Molyneux ME (July 2007). "Finger-prick blood samples can be used interchangeably with venous samples for CD4 cell counting indicating their potential for use in CD4 rapid tests". AIDS. 21 (12): 1643–5. doi:10.1097/QAD.0b013e32823bcb03. PMC 2408852. PMID 17630562. ^ "Michigan careers". Michigan.gov. 2010-01-05. Archived from the original on June 29, 2011. Retrieved 2011-08-09. ^ Belargo, Kevin. "Cholesterol Levels". Manic EP. Retrieved 17 January 2012. ^ "Fasting blood samples". NHS UK. Retrieved June 21, 2012. ^ "Blood gases". NHS UK. Retrieved June 21, 2012. ^ "Glucose tolerance test". Medline. Retrieved June 21, 2012. ^ "Blood tests normal ranges". Monthly Prescribing Reference. Retrieved June 21, 2012. ^ "Appendix B: Some Common Abbreviations". MedlinePlus. U.S. National Library of Medicine. Retrieved 2016-04-16. ^ "Understanding Blood Tests Online". Lab Tests Portal. Retrieved 2016-04-16. ^ "Press TV - Saliva test to substitute blood test". Presstv.ir. Archived from the original on 2011-05-21. Retrieved 2011-08-09. ^ Denny P, Hagen FK, Hardt M, et al. (May 2008). "The proteomes of human parotid and submandibular/sublingual gland salivas collected as the ductal secretions". J. Proteome Res. 7 (5): 1994–2006. doi:10.1021/pr700764j. PMC 2839126. PMID 18361515. ^ "Microchip offers faster and cheaper way to test blood". CTV News. Bell Media. 2 February 2011. Retrieved 2 October 2016. ^ Taylor, Kate (2011-03-18). "Blood analysis chip detects diseases in minutes". Retrieved 2011-03-26. ^ Dailey, Jessica (2011-03-22). "New SIMBAS Blood Analysis Biochip Can Diagnose Diseases In Minutes". Inhabitat.com. Retrieved 2011-03-26.